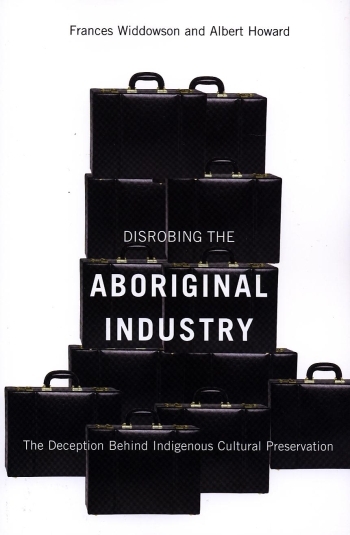 The following is a response to Niigonwedom Sinclair’s critical review of Disrobing the Aboriginal Industry: The Deception Behind Indigenous Cultural Preservation by one of its co-authors, Frances Widdowson. An “inconvenient truth.” Hilarious. I almost wish she'd stay silent – the attempts at rebuttal only further reveal her ignorance. I'm starting to wonder if it's not a little bit beyond her scope of understand that while she's admittedly working from an institutionalized and yes, “academically rigorous perspective” that it *is* just that – a perspective (which she mistakes on more than one occasion for “truth.” There are myriad forms of “scholarship” within “scholarship” and FYI, Derrida and Foucault (even the hallmarks of yes, Eurocentric academia) built a career on *mostly* referencing himself. I strongly recommend a read of David Theo Goldberg's work “Racist Culture” that shows how “scholarship” can be done responsibly. It's interesting how Widdowson only comments on the points she can use to justify her own opinions and assumptions. I would love to see her take some responsibility. Now, I say opinions, because a number of the points she makes are not supported by empirical evidence. Rather, they are supported by a narrow conceptual framework that lets her comfortably dismiss key truths, interpretations, and anything of merit that runs contrary to her vision and her understanding of the issues. This is a key point because Widdowson claims that she is being objective and academically responsible. That is simply not the case. First, this assumes Indigenous cultures in the Americas were not developed (something that I'm sure she would not contest). Second, it assumes the criteria for building and defining civilization. And third, it assumes that the advancement (perhaps, from barbaric to relevant) is “inevitable” as long as the right conditions are in place. “Wishful thinking does not constitute legitimate criticism,” indeed. Her dismissal of wampum is no different. The fact is, wampum belts are records of important historical events and contracts, including relationships. The Two Row Wampum belt (Haudenosuanee) is the perfect example http://www.akwesasne.ca/tworowwampum.html along with the Border Crossing Belt (Anishinabe) The Seven Fires Belt (Anishinabe) the Niagara Treaty belt (Haudenosuanee) The 24 Nations Belt (Haudenosuanee) and the list goes on. There are hundreds of other wampum belts, which were never worn, traditionally. Perhaps if Widdowson did some actual reasearch, she would discover this. The same goes for her outright dismissal of the “'nation-to-nation' relationship between fish and human beings.” While it may sound completely absurd to her, she makes no effort to prove the claim or view it from the perspective of the Nishnaabeg. Maybe they do believe the Fish constitute a “Nation” (in a genetic and cultural sense) and maybe they do have a special “relationship” with that Nation, which is to say, an understanding based on dignity and respect, not just blatant killing, as she, once again, assumes. Overall, these and other assumptions invalidate her claim of objectivity, along with her assertions that depend on them. 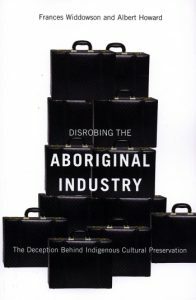 And while I give her credit for trying to engage in some meaningful debate, and while she and Albert Howard raise some valid points in “Disrobing the Aboriginal Industry,” much of they assert cannot be taken at face value. For the sake of drama, I would say, no more than we can take the assertions of a 5-year old trying to explain “Fotofynfisis”. Of course, there's a small chance the kid could get it right, but even so, he lacks the knowledge and experience to do it on purpose. Um, I don’t know about you, but I recall that there is abundant Anthropological evidence to suggest that there were Indigenous peoples here before Clovis culture. There is evidence to suggest that there were people inhabiting South America at least 33,000 years ago. I’d suggest taking a look at the book – “Skull Wars: Kennewick Man, Archaeology, and the Battle for Native American Identity” By David Hurst Thomas, to understand how Widdowson’s claims are a perpetuation of shoddy politically motivated scholarship. What’s more interesting to ponder is if there was two way travel on the Bering Straight land-bridge, what could that mean for cultures on both sides. Not to mention the fact it is a theory for F*$K’s sake. There is no conclusive proof. However, there is lots of proof to suggest otherwise. I’m no academic, thank God. But I can’t help myself. I would have no problem with Widdowson attacking some aspects of aboriginal academia and the consultant’s “industry”, which does contain some startling examples of poor scholarship and fruitless, and even corrupt, practices (although I would say it’s no worse than the non-aboriginal academia and consultancy world); however, there’s one problem: Frances is unqualified to make this attack, and in fact belongs with the type of people she claims to be attacking. I am well read and know my history and culture, and in my humble opinion, Widdowson is either writing in an ideologically blinkered fashion to a very bigoted agenda, or she’s just too dumb to be a professor (probably both). She clearly knows nothing about deeper Anishnabek perspectives, or those of any other nation, and has made absolutely no effort to try. In my experience, aboriginal academia is like all academia: it is sometimes capable of propping up some completely flawed and inherently slanted views based on selective intellectual myopia and a political agenda. But this is because the standards for modern academia are low, and there are in my experience an equal ratio of batty and ideologically driven white professors, all the way across the political spectrum (sorry, Widdowson, I didn’t have time to do an empirical survey, since I’m not ensconced in academia, but have to work in the real world). No doubt some very crappy (as well as excellent) aboriginal scholarship exists. But Widdowson is a perfect example of crappy scholarship, and is only attacking those as weak as herself. Yes, Frances, in an ideal world the substandard aboriginal “academics” and consultants would be drummed out of their privileged positions. But you would go with them. We just need to raise the standard of the academy and this kind of silly “debate” would disappear altogether. “built a career on *mostly* referencing himself” Yes, and so much of it is gibberish… He could only reference himself…. It is not my role to “raise the standard” of academia. As I said, I am not in or of the academic world, a lot of which is of highly questionable value, from what I can see, so like I say, I am thankful for that. If you like, I have directed an “ad hominem” at academia, in the very broad sense of making a statement against academia itself rather than its arguments – although I’m not sure how you expect me to address the diverse arguments of all of academia that I happen to be in profound disagreement with (a long list on both the left, centre and right) on a comments page. At any rate, I have read studies and reports with many “scholarly references” that are complete balderdash, so I’m not sure what that achieves… and I am entitled to that opinion, since I am not publishing in any academic journal, nor am I beholden to modern academic standards, which I regard as low indeed. I have certainly directed an “ad hominem” at Widdowson above (I really do find her profoundly offensive at a very personal level, and was probably in a snit when I wrote the comment), so point taken. It would be too easy to demonstrate her ignorance of indigenous ideas and realities, an ignorance which is carelessly splattered throughout just about anything of hers i have had the misfortune to read. I prefer to give you one example of her intellectual shallowness even in relation to the long history of her own coveted western “culture” (which, pardon the blanket ad hominem, is really a long social homogenization process that has left us in our modern dilemma, a horrific crisis if there ever was one). In her blog of April 4 2010, Widdowson describes the rites of Easter as a celebration of the “absurd notion of the resurrection of a mythical Supreme Being,” and reduces all of Catholicism (and in other places, any religion) to mere “superstition.” First of all, Widdowson’s definition of “myth” is clearly limited to modern pop sensibilities. Her understanding of the profundity of the Christian tradition, or any spiritual tradition, is mind-boggling. The rites and myths around Easter are of course absurd, as long as your intellectual grasp of metaphysical concepts is non-existent. Of course, there are people who take these rites at a completely superstitious level, but that does not make the religion itself a “superstition.” Whatever one may believe about religions, the etymology and real meaning of the term “superstition” is almost antithetical to the real meaning of religion, and to any authentic spiritual tradition (which do not include the watered down “new age” blather that has come into fashion in the west and stolen from everything from Sufism to various indigenous spiritual traditions). You can pile up as many “scholarly references” as you like, but WIddowson demonstrates in her own words that she does not understand the meaning and depth of even her own culture, language and history. it is no wonder she cannot even begin to grasp those of other cultural groups. Gerry Gagnon, Armchair Philosopher of Language. Go read Wittgenstein’s later work and bring your understanding of language into the 20th century. Till then. Stick to making bowls.